Men Wot Sing - Incredibly Well Sung! Click here to check out our Testimonials Page!!! 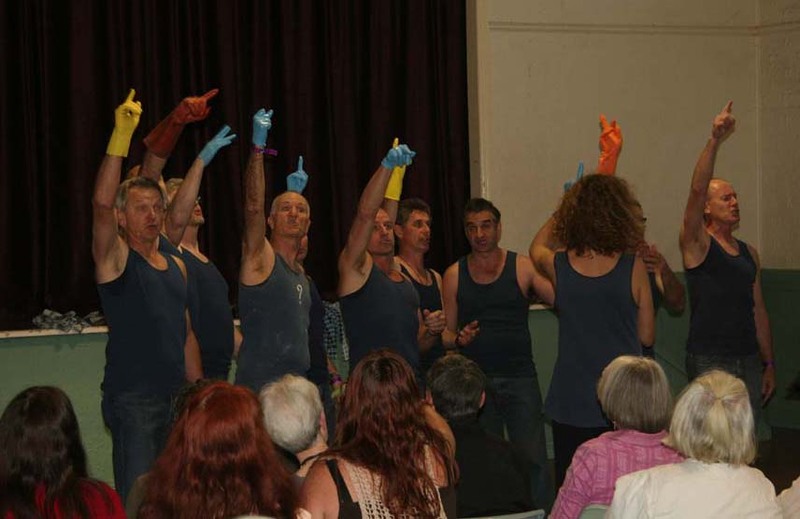 After a year and a half away from the bright lights of the stage, MEN WOT SING made a triumphant return to the world of quirky, high quality blokey A Cappella at the atmospheric Stokers Siding - 15 Minutes of Fame on Friday, 02 September, 2016. Here's a glimpse of one of our classic numbers! Want to sing with the boys??? or simply come along for a sing! It's great fun - you'd better believe it!! Below, a few shots from our Sydney performance in 2013 at the Local Government Conference, Sydney Town Hall. newest biggest littlest gig - Rous Unplugged! CLICK HERE TO SEE THE YOUTUBE CLIP OF THE ROUS UNPLUGGED SET! Here's a look at the video for Throw Your Arms Around Me. It was a fantastic day - great people, great music and great friends! And here's a look at a previous workshop, doing one of the songs we'll be doing! Here's a shot of Men Wot Sing in action!! as he tackles the ever-present issue of fear of high notes! QUOTE OF THE DAY: "I haven't laughed so much in years!" 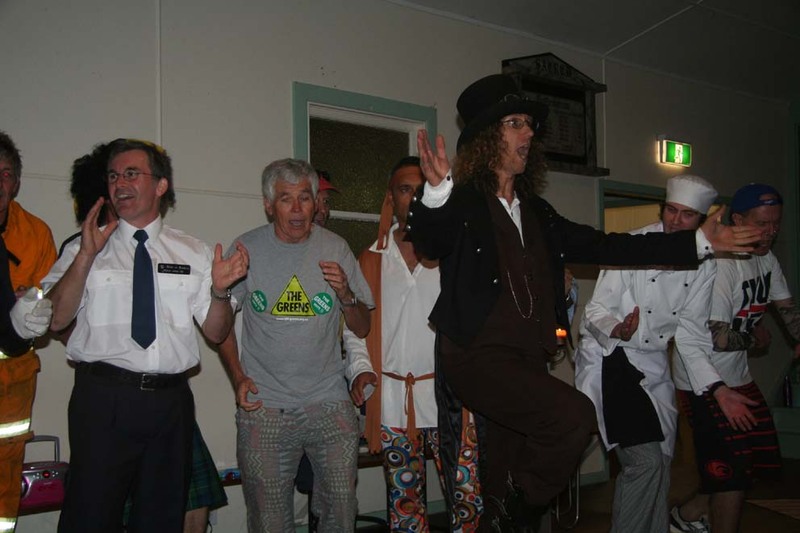 Check out our riotous reception for Barack Obama on his recent trip to Oz! 2012 is shaping up to be a good year for the group. Our planning crew are getting a series of events underway, including an awesome Yous Wot Sing" Workshop in Coolangatta on May 20th. More details will follow very shortly on this! But for now ... jump onto Youtube and check out some of our awesome vids! Here's one to get you going! Blackheath Choir Festival 2011 was a hoot! Despite being down to about one and a half baritones, Men Wot Sing put on a great show at the Blackheath Choir Festival on the weekend of August 26th & 27th. The festival was fantastic - with a wide range of choirs providing an even wider range of repertoire! By the timewe made it on stage is was 10.00 pm Saturday night and the audience (exhausted after a day of choir watching) did a great job of helping us feel welcome! Thanks Blackheath! Any questions? Please email Simon on md@menwotsing.com. 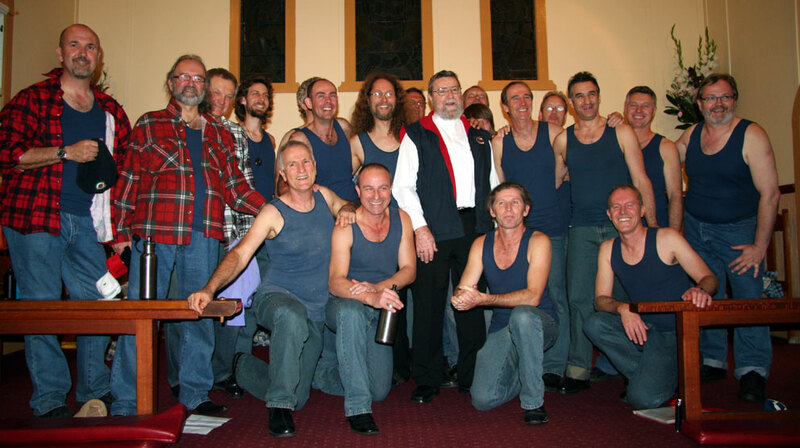 On April 2nd, 2011, Men Wot Sing got together with the awesome dudes and dudettes from Isaballa A Cappella and put on a fundraiser for the victims of the Christchurch Earthquake. The venue was at McCarthy Hall, St Joseph's School, Main st, Alstonville, NSW and the lads from the local Rural Fire Brigade put on a sausage sizzle and provided refreshments during the interval. All in all it was a fantastic evening - Loads of great feedback from happy audience members! We'll have a photo page up very soon! Here's a quick look at the flyer! 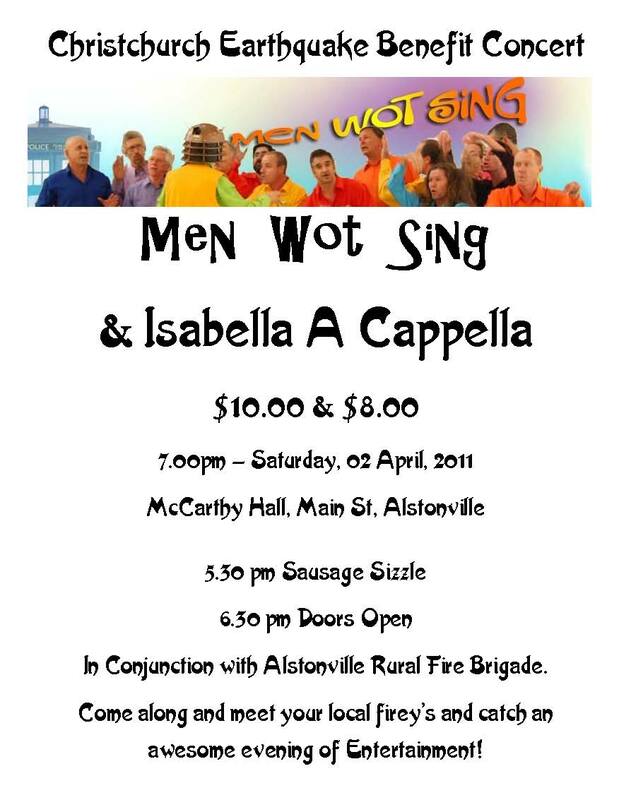 So come one and all and join Men Wot Sing and Isabella A Cappella for an awesome opportunity to catch some excellent entertainment, to meet the local Rural Fire Brigade and to raise some much needed funds for an excellent cause. Alstonville High School's 2010 Big Night Out! An awesome evening! Great vibe, great food and an all-round excellent evening! Men Wot Sing will be held a fundraising concert on Monday, August 16th at St Peter's Anglican Church, Coolangatta. The concert was to the benefit of Fr Ken Spreadborough and St Peter's Church which was badly vandalised on Monday July 19th. It was a tremendous success and we managed to raise $2750 for the church! Here's a shot Men Wot Sing with Fr Ken after the gig. Here's a collage of shots from Men Wot Sing's 2009 Woodford Folk Festival! ­It was an unrivalled success!!! If you are looking for Entertainment, then look no further! Swoon at the stirring African rhythms! Gasp at the raw power of the male voice! Bask in hauntingly beautiful Celtic harmonies! And laugh at pretty much everything else! Fresh-ish back from a standing ovation tour of New Zealand and having rocked the heart out of Brisbane, Men Wot Sing are sounding better than ever. Now 20 strong, this all-blokey singing supergroup from both sides of the Qld/NSW border is ready to entertain you! Men Wot Sing are a bunch of disturbingly good looking guys with phenomenal voices and very colourful shirts. With a swag of exciting songs from near and far, these highly acclaimed performers from both sides of the Qld/NSW border combine amazing talent with magnificent harmony to present a show of unrivalled and utterly enthralling entertainment. Men Wot Sing have been strutting their stuff for over nine years and their enraptured audiences are treated to stunning original songs and arrangements of world music as well as comedy and contemporary songs from well known artists such as Paul Simon, The Beach Boys, Hunters and Collectors, Tripod and Monty Python. and read up on our new Community Benefit Concerts - where we provide the venue and the entertainment and you provide the audience! Together we can raise money for the benefit or cause of your choice! It's a real win win situation!